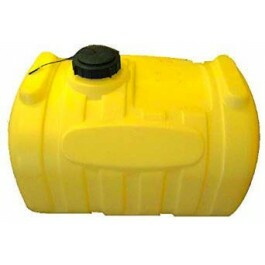 Ace Roto-Mold / Den Hartog 40 Gallon Blow-Molded Applicator Tank, part# SB00060SYSS, is a yellow plastic horizontal tank used for transporting water, fertilizer, and chemicals. This portable plastic tank was designed for a variety of applications and industries such as: full drainage applications, lawn care, agriculture, and everyday liquid transportation. It's constructed with seamless rotational molded polyethylene and has a 1.7 specific gravity rating. UV inhibitors give added protection against direct sunlight allowing for both indoor and outdoor use.